Sitting on a horse is just sitting right? Not really. There's a huge difference between being a rider and being a passenger. Staying on and controlling a horse requires the same sort of body control that many other sports require—like ballroom dancing, martial arts, downhill skiing, and others. You need to learn how to use your body and balance to make your ride more comfortable and safe, and easier for your horse. But, it's easy to pick up bad habits, especially if you don't regularly work with a coach or instructor. Here are ten of the most common problems to watch out for as you learn to ride your horse. It's common for new riders to either let the reins slide through their fingers and their hands to be flat. This happens because they allow their hands to become flat and their fingers open. Remember to close your fingers on the reins, some will say with the same pressure you'd hold a baby chick, and keep your thumbs up. If you draw a line across your knuckles, the angle should be about 30 degrees. If your knuckles are too flat, the line would be horizontal to the ground. If your thumbs are sticking straight up, your hands are at 45 degrees. Flat hands make it more difficult to give effective rein aids and holding the reins too loose means your horse can easily pull them through your fingers. Posture is our Achilles heel. Whether we're walking, at the computer or on a horse, we constantly have to check and correct our posture and keep my shoulders back. We even have a 'Shoulders Back' to help me while riding. Slouching your shoulders means you may have a more difficult time maintaining a good seat and effective rein aids. Leaning forward makes it hard to cue your horse properly. If your horse stops or spooks suddenly, you're already forward, and you may find yourself tipping further forward—or even coming off over your horse's shoulder. “Heels down” is something most beginner riders will hear frequently from their coach. Heels tend to float up or get rammed down. Either problem will stiffen your leg and puts them out of position to cue your horse. Because your leg will be out of position, your body will compensate, throwing you out of a safe, centered seat. Here's why you need to learn how to relax your leg and keep your heels down. Stiff and heavy hands are as bad as hands that are flat and loose. Heavy hands are harder on the horse though, because if you ride with heavy hands you'll be putting to much pressure on the horse's mouth. This can cause problems like head tossing and rearing. Don't clench your hands as if making a fist. Hold the reins firmly but gently. Looking down means you won't be looking where you are going, and you'll be heavier in the saddle. This makes it more difficult to cue your horse. While banking your turns may be desirable on a bicycle or airplanes, you don't want to lean inside as you ride circles or bends. In order for your horse to balance you easily on bends, you want to keep your own balance as centered as possible. Leaning inwards makes this more difficult. A good example is the way many barrel racers take tight turns. You'll see they actually keep their weight centered, letting it fall inwards on the turns. Sitting in a chair position on a horse is a very common problem. It makes it hard to cue your horse, post or sit the trot and keep your arms and hands in the correct position. As we're told to sit up straight and put our shoulders back we may actually over-compensate and hollow out our backs. Some of us are naturally swayback. Having a hollow back affects your position in the saddle, affecting our balance and our ability to move with the horse. In an effort to grip with our legs and stay on our horse, many of us pinch with our knees. This makes it hard to apply leg aids and affects your position in the saddle. It can make posting the trot more difficult and add bounce when you try to sit the trot. 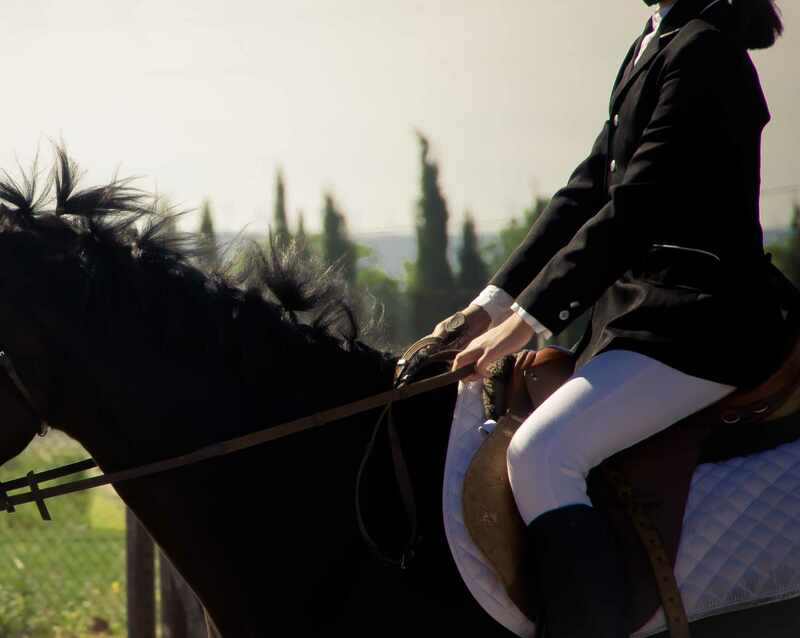 Your elbows should always remain at your side while you ride and unless you're going over a jump, or you need to release your horse's reins when they cough or trip. After your horse has landed or recovered, elbows should be back at your side. Keeping your elbows straight and stiff affects your balance and ability to effectively cue your horse.